Contrary to what many may think the unique sounds of the flute and harp are not a discovery of the French impressionists towards the end of the 19th century. The Ancient Egyptians used them for feasts and religious celebrations and from the many paintings of the Middle Ages, there is ample proof of a centuries-old popularity and existence. Still, the 19th century is of paramount importance in the technical development of the two instruments, as it was from 1810 onwards that vital breakthroughs were made in both their construction and playing possibilities. By the 1880's a level of almost technical perfection was reached. The collection on this disc covers a considerable array of composers and spans from the end of the 18th century to the closing of the 20th . 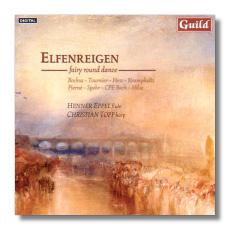 The album gets its name from one of the pieces included; Willy Hess's 'Elfenreigen', Op. 79 which, in a free translation, means 'Fairy round dance' and what a sheer delight it is. This is angelic music of incomparable beauty by some well known and other less famous names. I was particularly taken in by Krumpholz's Sonata Op. 8 #5 and Tournier's 'Two Romantic Preludes;', Op. 17, but the remaining six pieces also manage to conjure up an aura of almost visionary joy. Henner Eppel and Christian Topp play with their feet on the ground, but their hearts are on a higher plain. Inspiring interpretations filled with rarely-encountered sensitive nobility. The concise but informative notes by Eppel are an added bonus to an album superbly engineered and enchantingly realized.